' ... 15,000 Acres of 'Green Enclaves' ! Our Massive amounts of ' Green Enclaves ' gave Palm Coast the Developer Pledged Density of : '.....2.7 per Acre...less than that of Beverly Hills...' as documented in ' An Approach to a New City: Palm Coast'. This can be read in the HEADER 'The Palm Coast Project'. Dr. J. Norman Young the first President of ITT Levitt here along with Dr. Stanley Dea authored ' An Approach to a New City: Palm Coast. This was Dr. J. Norman Youngs concept about his Palm Coast Project. He is the 'Father Of Palm Coast'. 15,000 Acres of ' Green Enclaves ' and '...low population densities...' . 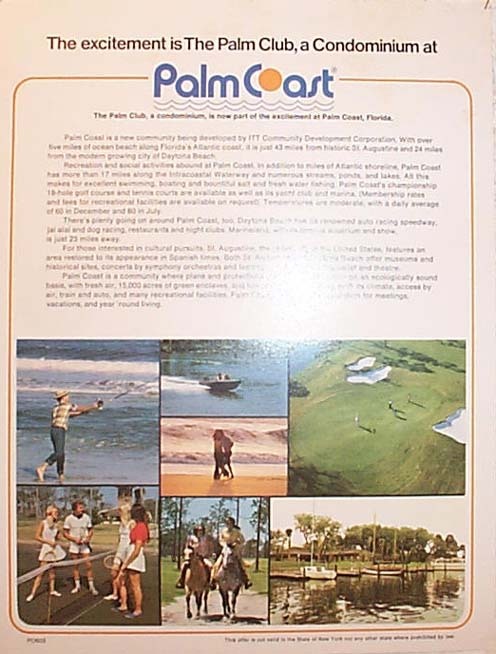 The Palm Club, a condominium , is now part of the excitement at Palm Coast, Florida. Palm Coast is a new community being developed by ITT Community Development Corporation. With over five miles of ocean beach along Florida's Atlantic coast, it is just 43 miles from historic St. Augustine and 24 miles from the modern growing city of Daytona Beach. Recreation and social activities abound at Palm Coast. In addition to miles of Atlantic shoreline, Palm Coast has more than 17 miles along the Intracoastal Waterway and numerous streams, ponds and lakes. All this makes for excellent swimming , boating and bountiful salt and fresh water fishing. Palm Coast's championship 18 - hole golf course and tennis courts are available as well as its yacht club and marina. ( Membership rates ad fees for recreational facilities are available on request). Temperatures are moderate, with a daily average of 60 in December and 80 in July. There's plenty going on around Palm Coast, too. Daytona Beach has its renowned auto racing speedway, jai alai and dog racing. restaurants and night clubs. Marineland, with its famous aquarium and show, is just 23 miles away. For those interested in cultural pursuits, St. Augustine, the oldest city in the United States, features an area restored to its appearance in Spanish times. Both St. Augustine and Daytona Beach offer museums and historical sites, concerts by symphony orchestras and leading artists, and touring ballet and theatre. Palm Coast is a community where plans and protections will help growth occur on an ecologically sound basis, with fresh air, 15,000 Acres of green enclaves, and low population densities. With its climate, access by air, train and auto, and many recreational facilities, Palm Coast proves an ideal location for meetings, vacations, and year 'round living. The luxury, splendor and joys of good living are all yours at Palm Club. This magnificent condominium is located at Palm Coast, one of Florida's most exciting new communities; a wonderland of sparkling beaches, green woods, wild flowers, lakes and streams. It is a water-oriented community with more than five miles of sparkling beach along the Atlantic ocean and over 12 miles along the Intracoastal Waterway. Here, you can experience the joy and pleasure of living close to nature in an uncrowded, spacious atmosphere. At the same time, you can also enjoy the convenience of being within easy reach of diverse shopping facilities, fine restaurants and year-round entertainment. There are many things to see and do in the nearby area. Daytona, with its world-famous speedway and its busy nightlife is only 24 miles to the south. And just 26 miles north, you'll find charming Saint Augustine, the oldest city in the nation with its famous restorations, quaint shops and cheery little side streets looking much the same as it did in the 17th Century. The location of Palm Club within the Palm Coast community is a dream come true. On one side, the rolling greens of the Palm Coast Golf Course stretch out before you creating a feeling of spaciousness. On the other side, canals dotted with boats sailing by furnish a marvelous view. And all around a combination of natural greenery and fine landscaping bring nature close to you and provide both esthetic beauty and a welcomed feeling of privacy. As an owner of a Palm Club condominium, you can enjoy some of the most extensive recreational facilities on Florida's northeast coast. All of Palm Coast's amenities are open to you including immediate membership in the Golf and Yacht clubs at low resident rates. The golfer can take special delight in the fact that the place he calls home is just short walk away from Palm Coast's 18-hole championship golf course. This '" Magnificent Monster " with its great trees, water hazards and well-placed traps has been acclaimed by touring pros as one of the finest courses in all of Florida and is the site of the Annual Palm Coast Open on the PGA tour. For tennis enthusiasts, courts with the latest synthetic surfaces are available within easy walking distance from your front door. About a half-mile down the road, you'll find the Palm Coast yacht Club with excellent facilities and a delightful array of diversions. There are two main dining rooms, a bar, lounge and huge game room designed in an intriguing African motif. Outside the clubhouse, there's a Junior Olympic size swimming pool that is often the site of swimming meets held as part of Palm Coast's Community activities program. There's also a gigantic sundeck, 2 tennis courts and a 75 slip marina that acts as a welcome 'oasis' for boats passing by. If fishing is your 'thing' , this part of the country is a veritable paradise. Whiting, channel bass, bluefish and pompano are regularly caught in the area and there's an awesome variety of big game waiting for the adventurous angle in the cobalt blue waters off shore. In addition to all of these amenities offered at Palm Coast, your Palm Club condominium will offer you your own recreation center including swimming pool, sundeck and game room. As an owner of a Palm Club condominium, you will receive a warranty deed giving you full title to your residence. You can forget about maintenance, painting, fighting weeds, mowing lawns and all of the rest. Instead, you can devote your time to golf, tennis swimming, boating and fun. Another advantage of being a Palm Club condominium owner is that you are entitled to deduct all interest and real estate taxes from your Federal tax return. At Palm Club, you can choose from wither one or two bedroom layouts, or two bedroom townhouses, to suit your particular needs. All first floor units will have terraces and all second floor units will have balconies for sunning and enjoying the view. Many will also feature screened-in porches. All apartments will come complete with wall-to-wall carpeting in living areas, vinyl floor kitchens and ceramic tile in baths. Your work-saving GE kitchens will include a 14 cu. ft. refrigerator, electric range, dishwasher and washer/drier. there will be individual air conditioning and heating controls in each apartment. Every layout has been designed with comfort and convenience in mind. Consider all the Palm Club has to offer. With each new day there are a host of interesting and varied activities close by...from playing a championship golf course in the early dawn to luxuriating in the beauty of a spectacular sunset. It all adds up to a way of life that promised to be rich and rewarding to you and your family. We will remain Stewards of these Heritage and Historic Resources hoping for a Museum like Flagler Beach already has; hoping for a Certified Local Government like so many other Leadership Florida Cities already are !